A few months ago, The Huffington Post wrote an article about the calming effect that owning a pet can have on your heart rate. According to the article, Pedigree Australia performed an experiment in which three dog owners’ heart rates were monitored while they sat alone on a couch in front of a camera crew. Their dogs were then sent in to sit with them, and the researchers monitored the heart rates of both the owners and the dogs. When the dogs entered the room and sat on the couch, their owners’ heart rates spiked and then lowered, showing that they were more relaxed and at ease when their dog was sitting by them than when they were alone. At some points during the experiment, the heart rate of both dog and owner even rose and fell at the same intervals, showing how connected the two were. This is only one of many studies that have been performed on the positive effect of having a pet around. For example, there are many stories of dogs helping men and women who are suffering from post-traumatic stress disorder by providing a calming effect on their mood. Dogs who work with war veterans or people who have been through a traumatic event are specially trained to act as another set of eyes for their owner. Not only do they provide stability, comfort and familiarity, they are taught to watch out for their owner, helping to allow the person suffering from PTSD to feel safe. There are also tons of examples of dogs that help children with autism feel more comfortable in their environment, notes Autism Speaks. A pet may help a child with autism improve his or her social skills or generally be less anxious. In fact, The Huffington Post reports that children who have a dog at home are known to have decreased issues of childhood anxiety. Having a pet at home gives you an automatic best friend, one who will never be mad at you for not calling him back, but who will provide consistent and constant love and support. The benefits of having a dog are certainly great for someone who is dealing with PTSD or anxiety, but the mental health benefits can extend far beyond lowering one’s stress levels to helping them not sweat the small stuff and just relax and be themselves. If you’re ready to add a dog to your family today, Pauley’s Pups is here to help. Check out our list of available puppies online now, or stop in and see us at the store in Ashland, Virginia today. 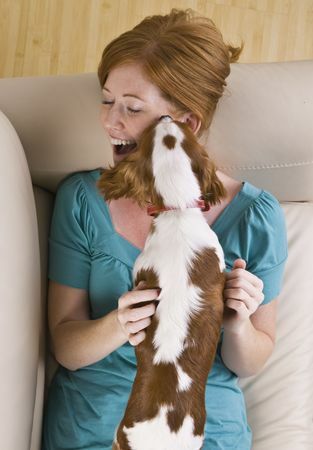 To learn more about any puppy, give us a call at 804-798-7877 today.